Hello!! Hope everyone had a wonderful Thanksgiving! It's saturday so that means it's time for another great sketch from The Sweet Stop! I think the next few weeks you'll be seeing Christmas cards for my sketchs, i seem to be getting off to a late start this year! It'll be here before we know it!! I used a Gina K image that i've have colored and in my stash for awhile. All the red and green parts are colored with glitter pens and are sparkly, kinda hard to see that in the picture. Be sure to check out what the other sugar babies have made this week. Thanks for stopping by and have a great weekend!! Adorable, Janice..love the sparkle. Your image and the papers used look so festive...perfect for Christmas! Have a wonderful weekend...Hugs! this is adorable, love all the buttons! Sweet card Janice. Love that image and the traditional colors. The buttons are so cute! This Ginger Bread house is so cute. Love the colors and buttons. Adorable! 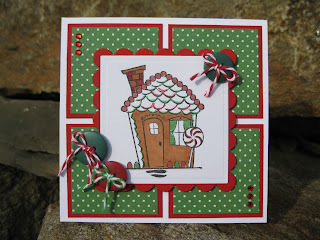 I love the coloring on the gingerbread house and the buttons are too cute!